The stone circle at Hatton of Ardoyne is set on a bleak and windswept hilltop, all gorse and stunted pines, lending atmosphere and wide views to a ruined circle. Take boots and a map for this one. From Inverurie follow the A96 north-west. Just before the road-end for Old Rayne, two minor roads fork to the left, one going to Oyne. Follow the other one to Hatton of Ardoyne. There are buses from Aberdeen to Old Rayne, but if driving take care parking on the narrow road. Ask permission at the farm to go up to the circle. Walk up the steep track which can be knee-deep in snow in winter - be warned! Go past farm steadings and a cottage, and along the edge of a couple of fields. Skirt round south of the hilltop avoiding the gorse. Snow and gorse is not a nice mix but this circle is at its most dramatic in snow. The circle is somewhat below the summit of the hill. Sadly there's a fence right across the middle (not unusual) and walling between the stones on the south side. 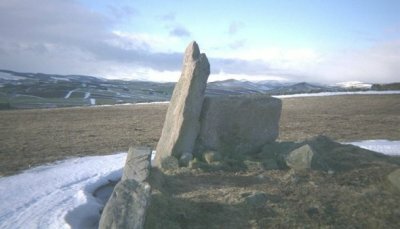 Most of the stones are scattered and broken, but the recumbent stone, one tall flanker and three more stones are still standing, plus the remains of the inner ringcairn can be seen.